GALION — Brenda Leone wants to make a difference for those in need. Leone, who moved to Galion five years ago to be near her son and his family, is from Findlay. She said she has felt at home and welcomed here since day one. Leone said she deals with various health issues, and she knows what it is like to fall on hard times. She lives on a tight budget, and doesn’t always have a lot extra to spare. But that hasn’t stopped her from thinking of others who could use some help from time to time. A few weeks ago, Leone heard about a project in Findlay called the “Little Free Pantry,’ and her heart was touched by the idea. The Little Free Pantry is a standalone, enclosed box located outside a bakery on North Main Street in Findlay. It can be filled with non-perishable boxed or canned food items that won’t be affected by adverse weather conditions. However, household items such as toothbrushes, diapers, or dry formula have also been donated. If someone needs a little help, they’re welcome to come to the Little Free Pantry and take what they need. She said the response to the pantry in Findlay has been overwhelming. It has been going strong now for the past year. In Galion there is something similar. There is an enclosed box in front of the YMCA on Gill Avenue that contains books. Anyone is welcome to come and get a book and read it. There is another similar box on the west side of Galion, too. “If it can be successful in Findlay, we can do it in Galion,” she said. She posted the idea on Facebook just over a week ago to see if there would be any interest or support locally. The response was overwhelming. 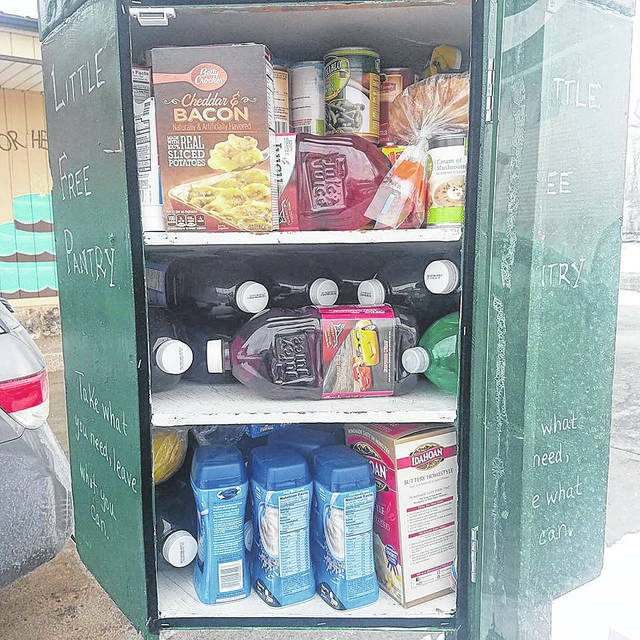 While Galion’s “Little Free Pantry” is still in the planning stages, Leone is definitely looking to make it happen. If you are interested in helping, have any ideas or questions, please feel free to contact Brenda Leone at grammybll9@gmail.com.